Waves crash on shore at Sedge Bay of Yellowstone Lake in Yellowstone National Park. Captured with a Canon 5D III and 17-40/4.0L in aperture priority mode with an exposure bias of + 2 at ISO50, f/22, and 1 second. The camera was mounted on a Gitzo 3540XLS and Arca-Swiss Z1sp, a 4 stop neutral density filter was used. My second trip with students of the fall...was...well, okay. The wether was cold/snowy compared to the first trip (September 15 & 16, 2012), the activity was less than stellar, this fall has not been a great one in the park. The students got plenty of learning done, and I think they should have come home with a number of good photographs. We left Billings (Rocky Mountain College) at 5:15a on Saturday morning and made our way quickly to the Park's North entrance, arriving right at sunrise...well we think so, it was very cloudy and snowing. We made a fairly uneventful drive to Swan Lake flats, stopping only for a few elk here and there. Swan Lake was frozen over, and we did not see any Swans on the ice, so we continued South. An Ermine ran across the road and off into the snow and sage, leaving us with a good sighting, but no photographs. The miles rolled by with only occasional stops for the students to take in the sights and snap a few photographs of the snowy landscape. We decided to walk the full Norris Geyser Basin loop and made some nice images along the way. From there we drove to Canyon to check on the great grey owls, but that was a bust, so we drove South towards The Lake. 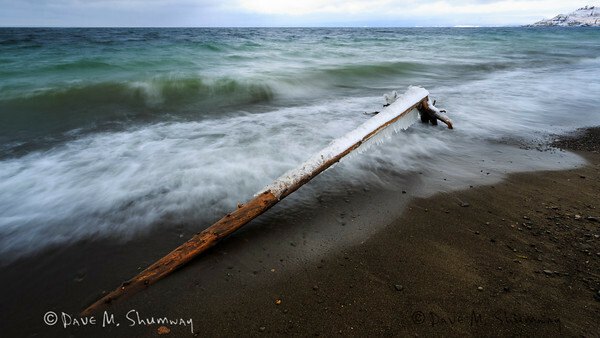 A go to move for me is to head to Sedge Bay and photograph the lake, waves, and whatever else I can find. We spent about 30min shooting crashing waves, ice covered logs, and the falling snow...then a grizzly bear decided to come and put on a show. We spent about an hour photographing the bear along the shore of the lake, as the bear approached I moved all of my students back up the hill, as we did that three tourists ran down the hill and whistled to get the bears attention...scaring the bear up the hill and away. After the drive by we decided to leave the bear alone and make our way back to the North. We stopped to check on the owls again, again with no luck. We didn't stop again until we got to Gardiner, as the clouds kept us from having a nice sunset. K-BAR was closed so we went to Outlaws for pizza before returning to Super 8 for a good nights sleep. The next morning we were up early and made our way to Lamar, stopping only to shoot a few landscapes (again the sunrise was a bust due to clouds). At Pebble Creek we spent a while photographing a mousing coyote, but we turned around at Thunderer and headed back to Mammoth, then south to Norris, then West Yellowstone for lunch at Arby's. With the day being mostly a bust we decided to start towards home, we left the park and stayed left on the old river road to drive along the Park's boundary where we photographed pronghorn antelope and realized that one of our vans had a flattening tire. It was the van I was driving, so the other van left for home while I changed the tire with the help from a few students (many hands make light/quick work). As a reward for running late we ordered a few pizzas only to get a call back that the Livingston Pizza Hut was closed because their hot water heater was out. McDonald's was our only other real option, so fast food it was...then the long (slightly slower than usual) drive back to Billings. The students had a good time and did plenty of learning, so I'll call the trip a success.